SpaceX's nose-cone-catching boat, dubbed Mr. Steven, made its debut in February. Acting as a giant catcher's mitt, the vessel sports new upgrades that include four new outstretched arms and a bigger net that spans 40,000 square feet (3,700 square meters). LOS ANGELES — The Port of Los Angeles, my tour guide tells me, is the busiest port in the country; it's home to many abandoned warehouses that are frequently used for movie sets, and thousands of containers adorn its many docks. But nestled among the many freighters and fishing vessels is a hidden gem: a boat named . If you know where to look, Mr. Steven, a former offshore supply vessel, is easy to spot. Its four large arms shoot out from its deck, supporting a newly upgraded, bright-yellow net stretched in between. The new net spans nearly 40,000 square feet (3,700 square meters) — four times larger than its first iteration — and lets Mr. Steven essentially act as a mobile catcher's mitt. SpaceX designed Mr. Steven's outstretched arms (and robust net) to catch payload fairings, which historically have been discarded in the ocean after they separate from the rocket and navigate themselves back to Earth. Each fairing is a $6 million piece of hardware — accounting for one-tenth of the Falcon 9's price, according to SpaceX CEO Elon Musk — and in a news conference following May’s Bangabhandu launch, SpaceX says it can save a bundle if it can recover fairings before they hit the water. In the past, fairings have been severely damaged when they've slammed into the water or been exposed to the briny water. During a pre-launch call (ahead of May’s Bangabhandu launch), Musk stressed the corrosive nature of salt water, explaining that the company wants to reduce costs by cutting down on the refurbishments that each fairing half goes through after landing in the ocean. And that's where Mr. Steven comes in. After the vehicle launches successfully and reaches a height of about 60 miles (100 kilometers), the Falcon 9's payload fairing separates from the rocket's second stage. The fairing's two halves fall back to Earth and, until now, land in the ocean never to be used again. Because SpaceX wants to recycle these pieces, the company has developed a system that will allow it to gently glide back to Earth where Mr. Steven is waiting. On Aug. 13, Mr. Steven was spotted with a piece of a fairing in the net. SpaceX was likely performing tests to see how the net would perform with a fairing in it as well as testing procedures before its next attempt to catch a fairing. Together, the two pieces measure nearly 43 feet tall (13 m) and 17 feet (5 m) wide and weighs more than 2,200 lbs. (about 1,000 kilograms). Resembling the hull of a boat, the awkwardly shaped fairing halves plummet through the atmosphere at high speeds, causing them to tumble. SpaceX has outfitted the fairings with cold nitrogen thrusters that allow the shells to stabilize, and once they've slowed down enough (thanks to atmospheric drag), a GPS-equipped, steerable parachute (called a "parafoil") will deploy approximately 5 miles (8 km) above the water. If all goes according to plan, the parafoil will enable the fairing piece to glide gently into Mr. Steven's net. On Aug. 13, I was treated to a rare sight: a view of Mr. Steven holding a fairing in its net. SpaceX appeared to be using the fairing to conduct tests that could allow engineers to better understand the properties of Mr. Steven's net. Visible in the net was one of the fairing's two halves, attached to a crane that repeatedly lifted and lowered it. 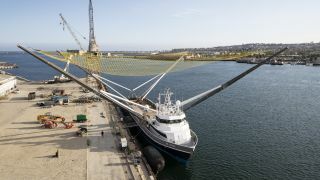 Mr. Steven's new net is larger and more robust than its previous version. By all appearances, the net seemed to be holding up against the weight of the fairing even when it was not supported by the crane. That's very good news, as SpaceX wouldn't want to catch a fairing only to have it crash through the net and onto the ship's deck. Right now, SpaceX is concentrating on recovering half of the fairing and continuing to scoop the other half out of the ocean. This achievement will mark a huge success for the Hawthorne, California-based aerospace company; managing to reuse just one fairing half for a few launches would add up to a significant cost savings over time. Currently, workers at the nearby rocket factory are hustling to ramp up production on the upgraded fairing (version 2.0), which will facilitate the company's recovery efforts. SpaceX's Cape Canaveral, Florida, launch site has been buzzing with activity the past few months, hosting a total of four launches since June. That tempo will slow a bit as the company switches its focus to the Vandenberg Air Force Base launch site, in California. In September and October, SpaceX is planning to launch at least two missions. The first, an Argentine Earth-observing satellite dubbed SAOCOM-1A, is expected to launch in late September. (The launch was originally planned for Sept. 5 but was pushed back to the end of the month). The second will be the final Iridium Next launch, in which a Falcon 9 rocket will lift the constellation's final 10 satellites into orbit. Mr. Steven will head back out to sea for its next attempt at a catch in September. The booster that will deliver the SAOCOM-1A satellite into orbit could potentially be the first Block 5 Falcon —an upgraded version of the company’s flagship rocket, designed to refly as many as ten times with no refurbishments—to refly from Vandenberg (just two months after its first mission), and it is expected be the first time SpaceX lands its first stage on the company's West Coast landing pad, dubbed LZ-2. If SpaceX can also snag a fairing half in Mr. Steven's net, that would be the ultimate hat trick.